In accordance with the UN General Assembly resolution 54/115 recognizing the day of Vesak as an international day of observance given its significance for Buddhists all over the world, the Vesak Festival was celebrated successfully at UNESCO Headquarters in Paris on 24 May 2018 by the Permanent Delegation of Sri Lanka to UNESCO in collaboration with Member States of the Asia Pacific Group. The event, which was organized on the theme, ‘Promotion of Peace and Non-Violence: Buddha’s Way of Life’ was graced by Minister of Higher Education & Cultural Affairs as the Chief Guest. The keynote speech on “Enhancing the Spiritual Harmony of Mankind with Buddhist Teachings” was delivered by Prof. Jun Hong Lu JP, Buddhist Master, Chairman of the World’s Parliament of Religions Foundation and the Australia Oriental Media Buddhist Charity Association. The celebrations commenced with an opening ceremony, which comprised of religious blessings by the Maha Sangha led by the Most Venerable Parawahera Chandarathana Nayaka Thero, Chief Incumbent of the International Buddhist Centre, and cultural performances portraying the life of the Buddha as well as messages of peace delivered by representatives of other religious faiths. The representative of His Holiness Pope Francis, Msgr. Francesco Follo, Permanent Observer of the Holy See to UNESCO delivered the message on behalf of the Christian faith, while Permanent Delegate of Iran to UNESCO, Ahmad Jalali delivered a message representing Islam. Rabbi Lewin Moshe, Jewish religious leader and Swami Veetamohananda, Head of the Ramakrishna Vedantic Centre, delivered messages on behalf of Judaism and Hinduism respectively. Addressing the opening ceremony on the topic ‘Buddhism as the path towards world’s peace’, Minister Rajapakshe traced the emergence of different religious ideologies, which all teach nonviolence, peace and compassion as core virtues. Minister Rajapakshe also highlighted with gratitude the role played by the Mahasangha in preserving Buddhism. Delivering the welcome speech, Sri Lanka’s Ambassador to France Buddhi K. Athauda said “at a time when the world is segregated into different groups with much enmity and violence, the Vesak season is an opportune time to contemplate on the teachings of Buddha which reflects on the virtues of living in cohesion among the diversity of cultures and religions”. 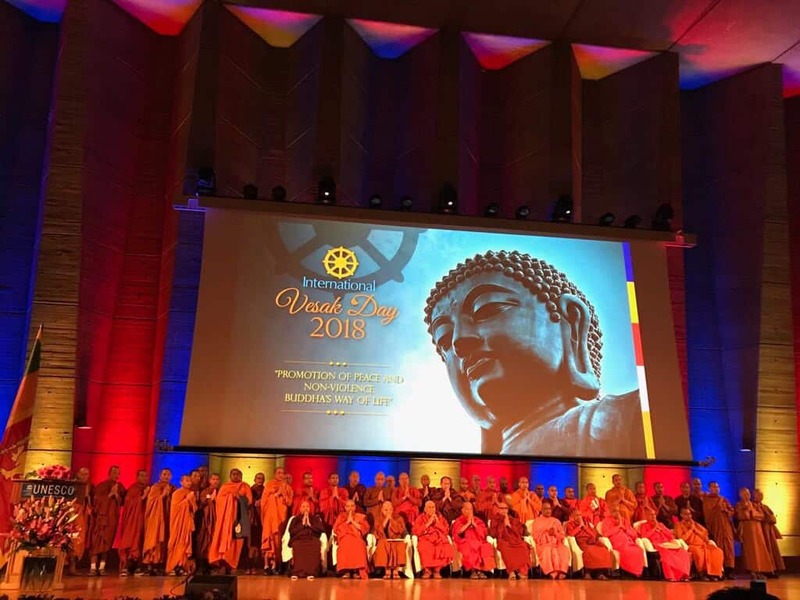 He also underpinned the significance of celebrating the Vesak ceremony at UNESCO, an organization created for building peace in the minds of men and women. The second phase of the day started with a meditation session conducted by the Most Venerable Parawahera Chandrarathana Nayaka Thero, Chief Incumbent of the International Buddhist Centre in Paris followed by a Symposium held with a view to celebrating intercultural and interfaith harmony. Erudite Buddhist scholar, Most Venerable Sitagu Sayadaw Dr. Ashin Nyanissara, Vice Sangha Raja and Chancellor of Sitagu International Buddhist Academy from Myanmar and renowned academic Prof. Osmund Bopearachchi, Adjunct Professor of Central and South Asian Art, Archaeology, and Numismatics, University of California, Berkeley, USA made presentations on the main theme. The presentations were followed by a panel discussion hosted by celebrated journalist and Head of France 24 English, Gallagher Fenwick where the panellists discussed and deliberated on the interfaith dialogue and cohesion. The celebrations concluded with an evening of vibrant and mesmerizing cultural performances showcasing diverse forms of devotion to Lord Gauthama Buddha and intangible cultural heritage of Sri Lanka. They were performed by the cultural troupe of the Sri Lanka Army who flew to Paris under the aegis of the Sri Lanka Army Commander, Lt. Gen. Mahesh Senanayake. They were joined by both local and international artists representing Sri Lanka and several other countries of the ASPAC Group enacting various dances as well as songs of devotion and peace. The cultural evening commenced with a devotional song by Jayantha Kapuwatta followed by a plethora of performances comprising of beautiful opera singing by a Japanese soprano singer, Ami Nakamura, pulsating dancing by the Chinese dancers, a French song on love sung by Lakshan Abeynayaka and Ambre Rochard as well as spectacular performances by the Sri Lankan dancing troupe. Simultaneously, an exhibition of Buddhist art created by famous artist Mahinda Herath was on display. A Ceylon Tea Station also operated at the premises, which attracted most of the crowd. The invitees were also treated to a food festival with an array of authentic Sri Lankan, Chinese, Japanese, Thai, Italian, and French cuisine catering to around 2500 people. The Vesak Day celebrations, were attended by over 2500 people including members of the Buddhist clergy, other religious dignitaries, politicians representing the French Parliament, members of the diplomatic corps and Permanent Delegates accredited to UNESCO, staff of the UNESCO Secretariat, media, academia as well as members of the Sri Lankan and other communities.